Submitted by Alexander Briones on Jan. 21, 2019. First published on Nov. 29, 2016 and last updated on Jan 22, 2019 . As you take your home recording to the next level, you will eventually outgrow your 2-channel audio interface. Here we take a good look at the current best stand-alone audio interfaces with 4 or more analog inputs, based on the most current reviews and ratings data up to January of 2019. This update sees the Tascam Celesonic US-20x20 secure a spot on the list, knocking off the once popular Apogee Quartet. NB: We have separate guides devoted to 2 Channel & Budget and iPad audio interfaces. 4-input audio interfaces offer portability while having more input and output options than 2-channel interfaces. These are great for beginners and are also affordable options for those who want to expand their home recording without spending too much. 89 out of 100. Incorporating 700+ ratings and reviews. Behringer is not one to pull punches, rather they bring out their big guns, as seen in this affordable audio interface, packing it with features that helped make it a favorite in the entry to mid-tier market. With its 24-bit/192kHz resolution, four MIDAS (a preamp and mixer console manufacturer acquired by Behringer) designed preamps, and its impressively wide complement of controls, this audio interface easily outclasses others on paper - and what's more impressive is how it performs in the real world, as proven by the many positive responses that it continues to rake in. The Behringer U-Phoria UMC404HD audio interface continues to be a crowd favorite, thanks to its affordable price tag. Some even favor it over more expensive units. Years after its first release, sound quality still gets a lot of praise, thanks to its built-in MIDAS designed mic preamps. The flexibility of capturing up to four sound sources simultaneously also gathered a lot of thumbs up. Finally, the UMC404HD's small footprint and USB bus powered operation makes it very portable, viable for both home studios and mobile recording situations. There was one user who cautioned that the phantom power switch controls all four channels, so you have to be careful when recording mixed sources. Others were let down with the lack of instructions, but they still gave high ratings because the learning curve was not too bad. If budget is limited, or if you're looking for an affordable backup, the 4-channel Behringer U-Phoria UMC404HD is highly recommended. 92 out of 100. Incorporating 150+ ratings and reviews. Steinberg is mostly known for music production software products, which include the popular DAW - Cubase. They have since branched out to produce good quality hardware, and have been successful with their audio interfaces. 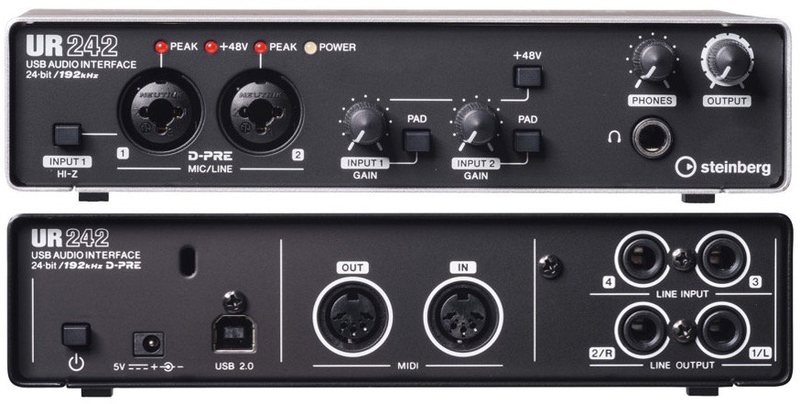 To be specific, the 4-channel UR242 continues to gain traction in the market with its two class A D-PRE microphone preamps, 24-bit/192kHz resolution, multi-operating system compatibility and Loopback functionality for live internet streaming. Inputs: 2 x XLR/TRS Combo, 2 x 1/4"
Good build quality gets mentioned a lot, while others are impressed by the Steinberg UR242's intuitive controls. Easy installation process and intuitive operation also help make it well received. Many experienced musicians and sound engineers are impressed by the D-PRE preamps' quiet operation and clarity, with some stating that it exceeded their expectations. Most concerns point to software and driver issues. There are also some users who reported having issues installing the bundled software Cubase AI. With its iOS compatibility and solid build, the Steinberg UR242 is definitely worth checking out. 91 out of 100. Incorporating 350+ ratings and reviews. Drawing from their mother company's (Yamaha) hardware manufacturing expertise, Steinberg's audio interfaces have become quite the market favorite. The UR44 is their representative in the 6-Channel category, featuring 4 class A D-Pre preamps, iOS compatibility and built-in Digital Sound Processing capabilities. This makes the UR44 a versatile interface that can handle both home and mobile recordings. As expected, this interface is designed to integrate well with Steinberg, but it can also be used with other DAW software. Inputs: 4 x XLR/TRS Combo, 2 x 1/4"
Many reviewers report that reliability, software compatibility and audio quality are the best traits of this compact USB audio interface. Most are impressed with its solid construction and low-latency operation, especially when used in conjunction with Cubase DAW software. The built in reverb, channel strip and the bundled mixing app also get a lot of thumbs up. Some wished for a digital output for easy expansion, but this is a reasonable limitation given the price. While it does work well with any DAW software, there a few that had issues using the UR44 with their Pro Tools setup. Finally, there were a few who complained about the initial setup being a bit more complicated than what they are used to, but they still did appreciate its overall performance. If you're using Steinberg's Cubase then you should take advantage of the extra mileage that you can get out of the UR44. When you're planning on recording more than four sound sources simultaneously, like when miking an acoustic drum kit, a singing group, or a band - you'll need a capable audio interface with more inputs. Here are the top rated interfaces that you should look to when you're considering further expansion of your recording capabilities. 89 out of 100. Incorporating 250+ ratings and reviews. Part of Focusrite's second generation of audio interfaces, the Scarlett 18i20 carries over the best of the original version with upgraded 24-bit/192kHz resolution, improved drivers and software bundle. It gives you the 8 combo XLR/TRS inputs with Focusrite's popular mic preamps, a 2-channel S/PDIF input and an optical ADAT input for expansion to a total of 18 channels. This second generation version also benefited from the collaboration between Pro Tools developer AVID and Focusrite, resulting in improved software control and the inclusion of the Pro Tools | First Focusrite Creative Pack into the software bundle included with each unit. The market is not as receptive to the second generation Focusrite Scarlett series as they were when the first ones were released - which is unfortunate because the new ones appear better on paper. But it's not all doom and gloom because the Scarlett 18i20 did impress many users, including experts who point to its Focusrite preamps as its best trait. Users report hearing noticeable quality difference when compared to other interfaces in the same price range, and have successfully used this unit to record a wide range of sound sources and instruments, including vocals, drums, acoustic guitars, electric guitar amplifiers and more. No thanks to regular operating system updates, most of the issues raised about the 18i20 pertain to problems with OS updates and driver compatibility. And while Focusrite does the best they can to keep up with them, there are still some who quickly write up negative reviews without waiting for updated drivers to solve their issues. Aside from software issues, there are a few who feel that Focusrite should've added more analog input ports, considering the price. When you're looking for a great sounding audio interface for your growing recording needs, then check out the Focusrite Scarlett 18i20. 91 out of 100. Incorporating 150+ ratings and reviews. The Octa Capture audio interface is true to its name, having eight combo XLR/TRS inputs with 8 Roland designed VS preamps that direct the signal to its 24-bit/192kHZ AD/DA converters. The VS preamps are designed to deliver increased headroom and dynamic range while keeping noise levels low, making it applicable for louder instruments like acoustic drums, guitar cabinets and more. The first two combo inputs are compatible with both microphones and Hi-Z sound sources. Other features include a 40-bit DSP driven cue mixing feature, built-in reverb, and Roland's Auto-Sens technology which automatically sets the ideal input levels, to make setting up this 8-channel interface more convenient and novice-friendly. The Roland Octa Capture gets increasingly good reviews from users of different backgrounds, with many describing it as an A+ quality product, in terms of build quality, sound quality and ease of operation. Experts are please with its versatile software and effects routing capabilities, and more importantly how it does all that while retaining an intuitive interface. The Auto-Sens feature also gets a lot of thumbs up, said to be especially useful for balancing more input sources, simplifying setup by quite a big margin, compared to other interfaces. Most of the few complaints point to driver and operating system compatibility issues, but this is to be expected given the many number of OS versions and updates. There are some who are taken aback by the price, stating that it should be a bit more accessible. If you are looking to expand your recording capabilities for recording acoustic drums, singing groups and the like, then the Roland Octa Capture should be high on your list. 95 out of 100. Incorporating 225+ ratings and reviews. The RME Fireface UCX is a feature-packed audio interface that's meant for professional use in both mobile and studio recordings. It has a total of 8 analog inputs, including two combo XLRs, while also providing more than a handful of output options. It also opens up your options in terms of digital connectivity, because it can work with USB 2, USB 3 and Firewire 400. But it's not just about connectivity, because this unit comes with RME's Hammerfall converters, known for their premium sound quality. Finally, it features TotalMix FX, a dual DSP system that allows for latency-free effects, processing, monitoring. Reviews are flooded with superlatives like excellent, great, superior and the like - all of which reflect the RME Fireface UCX's high ratings. Everything from sound quality, to its solid build, to its reliability got a lot of positive mentions. One user even reported having no problems and not a single instance of software crashing with his almost two years of use. Interestingly, value for money came up a number of times, from users who feel that the RME Fireface UCX is a great buy. Even Sam Inglis of Sound of Sound is convinced of its performance, saying "the main reasons for buying a Fireface UCX remain its excellent sound and performance in a computer recording context". There are a few who noted that the interface has some room for improvement, other than that, everyone seems very happy with their expensive interface. If budget is not an issue, and you're looking for a powerful and versatile audio interface, then the RME Fireface UCX is highly recommended. 16 channels seems to be about the limit of simultaneous audio inputs for a stand alone USB interface before you start talking about hooking multiple devices together via connections like MADI or ADAT. 90 out of 100. Incorporating 30+ ratings and reviews. The TASCAM Celesonic US-20x20 works as an USB audio interface, a mic preamp and it even has mixer functions. As such, it is gives you quite a lot for the money, which in turn catches the attention of many home studio owners who want a good value for money interface. Speaking of versatility, it works with Windows, Mac and even iOS (iPad/iPhone), with up to 24-bit/192kHz resolution, and it supports USB 3.0 along with USB 2.0. And it comes packed with 8 Ultra-HDDA mic preamps for plugging multiple mics, with hi-Z inputs on the first 2 channels for capturing bass or guitar direct. There is also the convenience of dual headphone outputs, for monitoring flexibility. Finally, it comes with built-in DSP for adding essential reverb, EQ and compression. Versatility and value for money is the common denominator among many reviews. They are followed by positive comments about sound quality, which speaks of the quality of the mic preamps. Barry Watson of Sound on Sound agrees with the majority saying: "For a band wanting to track in a home studio, or someone who simply must have lots of line outputs, this sturdy interface is extremely worthy of consideration. Due to its compact profile, there are some limitations that users raised including its limited phantom power control (you can't turn phantom power on/off per channel). There are also some who are not too happy with the small knobs. Still, with its incredible versatility, the Tascam Celesonic US-20x20 is a worthy addition to any recording setup. 94 out of 100. Incorporating 60+ ratings and reviews. Studio Capture is the flagship model of Roland's line of audio interfaces, and as expected, this one carries all the big guns, meant for professional studio use. It has a host of input options, including 12 combo XLR/TRS jacks, 4 TRS line inputs, and 1 S/PDIF input. The output options are equally impressive, with 8 TRS and 2 XLR outputs, as well as a S/PDIF out. The same extra features are available in support of the multiple input/output options, including Roland's Auto-Sens technology, and the built-in 40-bit DSP capabilities. Experts appreciate the generous input and output options that this unit provides, and after putting their units to the test with maxed input and output options, they found that the Roland Studio Capture passed with flying colors. Reviews are mostly positive, pointing to its sound quality, solid and reliable build, and easy operation - and all of these are from people who use different DAW software and operating systems, from those with Cubase on Windows to Pro Tools on Macs. There aren't that many complaints, other than sporadic driver and software update concerns. 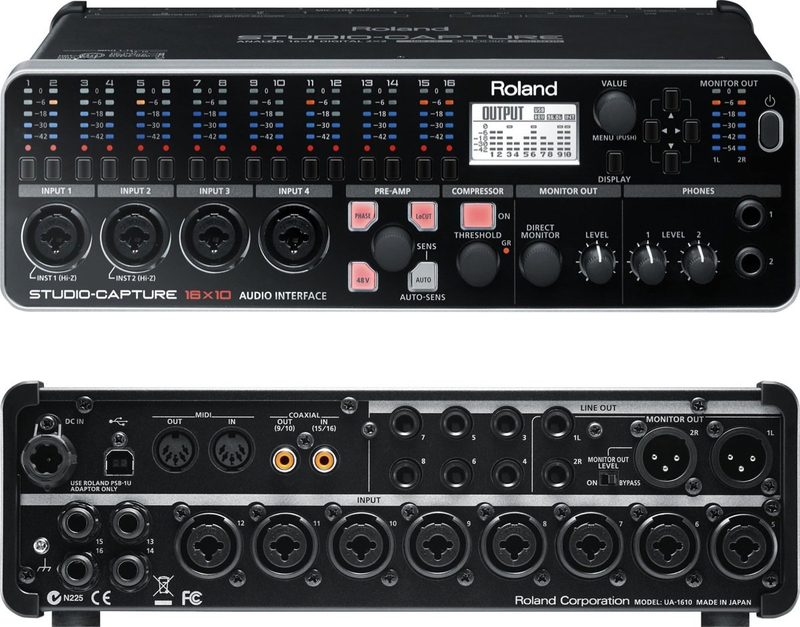 If you're looking for a reliable audio interface with 16 analog inputs, then get the top rated Roland Studio Capture. 95 out of 100. Incorporating 80+ ratings and reviews. The Fireface 802 packs RME's premium build and sound quality into an audio interface with 12 analog inputs. It features four mic preamps that are based on their popular OctaMic II hardware, all of which are paired with RME's brand of premium AD/DA converters. Other features include DSP-driven TotalMix FX mixer for latency-free effects and routing, and compatibility with USB 2.0, Firewire 400 and Firewire 800 protocols. Finally, it comes with Optical and XLR digital I/O support that allow for up to 18 channels of audio. Fantastic and wonderful are just two of the many positive adjectives that have been used to describe the RME Fireface 802. Clarity and overall sound quality is almost always praised, while others are very happy with its versatility and connectivity. Many of the users report that it works well on Macs, but there are also Windows users who are just as impressed. One user described the sound as clear and uncolored, ideal for those who want transparent recordings of instruments and vocals. There were a few who wish for added features like, extra XLR combo inputs, while some were not too happy with how the manual describes its operation. The RME Fireface 802 is a worthy investment for those who want a versatile and powerful audio interface in their studio. This one wouldn't have made it into the list on the basis of some user experiences but if you think you can avoid these issues then there's a bargain to had. 79 out of 100. Incorporating 300+ ratings and reviews. In the US-16x08 Tascam have produced a really good piece of hardware at a great price but it has been hampered by issues with its drivers over a period of time and this is reflected in the mediocre Gearank score. However if you are prepared to do your research and take the chance that you'll end up troubleshooting driver issues then you'll stand a good chance of ending up with a bargain. This unit offers a full 16 channels of inputs, 8 of which are Ultra-HDDA microphone preamps plus 8 line level inputs. The unit is USB Class compliant so you should be able to use the basic IO features without needing Tascam's drivers and this also provides compatibility with 'driverless' devices such as the iPad. Most users are impressed with the quality of the preamps, complimenting them for their strong signal and low noise operation. As expected, being affordable and easy to setup came up a number of times. A significant minority of reviewers say they have experienced consistent problems with the drivers, with reports of crashing, high CPU usage, and audio interruption. The problems seem to be more prevalent with Windows OS, while Mac users have generally fared better. Those who have contacted Tascam support were unimpressed with what help they received (as is a common theme with many manufacturers). That said, most users haven't experienced these problems and a fair few have found them fairly easy to resolve. Some report that they are able to bypass the problems with the Tascam drivers by using Class Compliant drivers instead. If you're looking for 16 channels of input on a budget then this is a great option. Most users who buy this are very pleased with the performance it offers and unless you strike driver problems you will be too. This is the number of analogue inputs that can be transferred through to separate tracks on your computer which sounds pretty simple. However we think some manufacturers fudge the number a little bit to give a higher channel count. Many of them include digital input channels to their devices such as SP/DIF or ADAT in the channel count, even though these would require another piece of hardware acting as an audio interface (EG some mixers and mic preamps also provide A/D conversion) to actually allow them to be used. So an "18 channel" interface might only be able to handle 8 analogue inputs by itself. This is why we've classified the interfaces in our guide by the number of analogue channels that can be input and be sent as separate channels via USB. This is not to say that these extra digital input channels aren't a handy option when you want to expand but they won't help you if you don't have another compatible audio interface. In addition to knowing the number of inputs, you also have to know the type of inputs available be it line level (low impedance) or instrument level (high impedance) inputs. Instrument level ports are for electric guitars and basses with no active preamp, while you can plug keyboards, amps and other electronic instruments in to the line level input. XLR inputs are usually accompanied by a preamp to handle microphones. Combo XLR/TRS inputs usually have preamps embedded, so they are mic ready. Some units have versatile line level and instrument level switching for specific ports. Built-in preamps allow you to connect microphones and they also can provide phantom power to condenser mics when needed. But they're not just for connectivity, because they can also effect the character of the sound and are responsible for keeping noise at bay. Thankfully, manufacturers rarely skimp on the quality of their preamps, often equipping their entire range of audio interfaces with the same preamp found on their flagship model. Note that not all inputs will have a preamp, so it is important to consider the actual number of preamps available, particularly for recording with condenser mics. As the channels increase, so does the complexity of the circuit, and its power requirement. So you can expect most of the units listed here to require wall power adaptors to keep them running. Still there are a few that can be bus powered via USB from a computer. Note that none of them can be powered via the USB from an iOS device so thankfully they all have an option to run via a mains power wall adaptor. This specification describes the resolution of your converted digital audio, and the general idea is that the higher the sample rate, the more details are captured. The current highest standard is 24-bit/192kHz, but there is a lot of debate about sampling rates so if you'd like to know more see: The Science of Sample Rates (When Higher Is Better — And When It Isn’t). The main thing to know is that a sampling rate of 44.1kHz will capture all of the frequencies that most people can hear. Also note that the preamp usually plays a bigger role in recording quality. Most audio interfaces come with specific custom low latency drivers for Windows and Mac that allow you to use the audio channels in your recording software and often control inbuilt hardware features such as effects/DSPs. However we've consistently found that most of the serious user complaints about audio interfaces come from a small number of owners who can't get these drivers to work properly. Often these can be attributed to people not setting things up properly but there are some cases were it appears there are genuine problems with the drivers on some systems. Furthermore many users find that the manufacturer support in the event of driver problems is lacking and some of them are slow to release fixes for these issues. By and large we've chosen the interfaces that have the least problems for our guide but few are immune to some degree of complaint. To reduce the chances of encountering these problems you should check to ensure that there are drivers available for your version of operating system and check to see whether other owners have had problem with systems like yours. One way to avoid manufacturer driver issues is to use a USB Class Compliant interface (audio and possibly MIDI) which means it can use standard drivers that are usually already available in your system. This will also 'future proof' your device in the event that the manufacturer stops releasing drivers for newer operating system versions. Using these drivers you may not be able to access some of the extra features of the hardware but the basic audio/midi channels will work. If you're looking for compatibility with iOS devices such as the iPad (via the Apple USB adaptor) then the device will need to be USB Class Compliant anyway. It's still best to make sure the manufacturer specifically mentions compatibility though. You can check out our iPad Audio Interface guide if you're looking for dedicated iPad audio interfaces. Most audio interfaces come with bundled software, some of which include "Lite" versions of popular DAW software like Pro Tools, Cubase, Ableton Live and more. Others even come with extras like virtual instruments, samples, in depth software control over the interface and more. All of these should be enough to get novice users started. Initially, we surveyed the market for audio interfaces with four or more analog inputs, focusing on those that are highly rated and popular. To make sure that you can actually buy the ones that make the list, we limited our scope to those that are easily accessible from online retailers in the USA. To better reflect current market sentiments, we took yet another look at the data, including the most recent reviews and ratings up to January of 2019. We ended up gathering over 5,000 sources, which were then processed by the Gearank Algorithm. The resulting ratings out of 100 along with the information we gathered were used to narrow down the list to just the best rated ones. Finally, we've divided the list based on the number of their analog inputs, to make it easier to find one with enough connectivity options to suit your needs. You can find out more about this process in How Gearank Works. Submitted by nils (not verified) on May. 10, 2017. Hi I have a question about the Tascam. to use it with my daw (studio one) would i need to use it's drivers anyways? Submitted by Daniel Barnett on May. 10, 2017. Hi nils, You shouldn't need to to use drivers to use the core interface capabilities as it can operate as a USB Audio Class Compliant Device. Without drivers however you won't be able to use the DSP functions or Tascam's special software but these are more add-on features. There are people who use the Tascam in class compliant mode on Windows but there's a chance that some fiddling could be required to stop it from wanting to use the drivers. Submitted by Lance (not verified) on Sep. 11, 2017. Submitted by Jason Horton on Dec. 17, 2017. It looks like no one running the exact same setup as you has answered your question, so even though I haven't used that specific combination myself I can let you know that it will function with your computer in it's basic mode without advanced features because it is Class Compliant - the standard USB drivers will take care of that for you. As to the features requiring the Tascam drivers, I don't know. Submitted by CMM (not verified) on Jan. 25, 2018. Submitted by Rossi Craft (not verified) on Nov. 23, 2018. Is it possible to link two Tascam 1608’s together to get 16 channels of micrphine preamps available. Or will they work simultaneously and will the software recognize two units? separately? If the answer is no, do you have or recommend an interface that will do this? Submitted by Rob (not verified) on Dec. 4, 2018. Submitted by Vito (not verified) on Dec. 17, 2018. Submitted by Jason Horton on Jan. 21, 2019.